If you want to get into laser cutting Worbla, you are going to need a digital template! 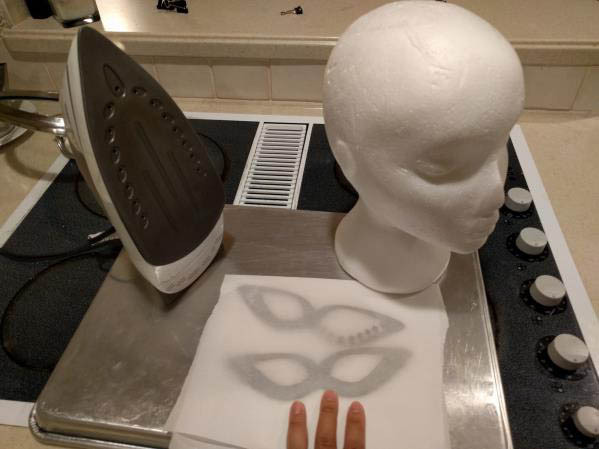 SmallRiniLady shares the process she used for creating her Harley Quinn mask below. 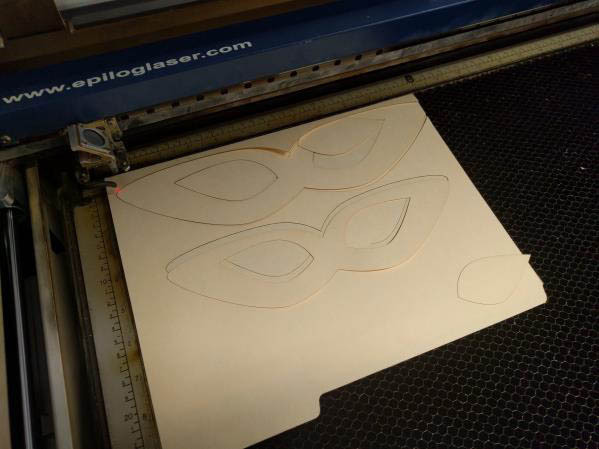 To “print” something to a laser cutter you’ll want to get your design into a Vector Graphics format. Laser cutters are treated as printers from computers so you can simply print a PDF from your computer and the software will convert the vector lines in your graphic into cutting paths for the laser cutter. There are some laser cutters that use software to convert hand drawn images to cutting lines, but due to accuracy issues I would not recommend it. Adobe Illustrator does include a LiveTrace option that will try to convert your pixel image into a vector graphic, I’ve found it to be hit and miss. A list of various software that can be used to draw vector graphics. 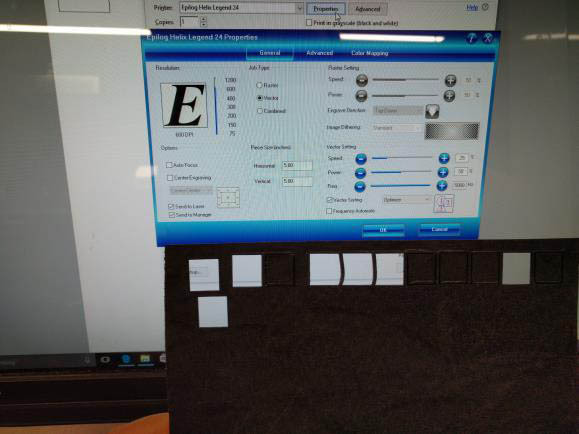 You can also find SVG templates online for scrapbooking cutting machines such as Cricut and Silhouette that often will work with laser cutters. 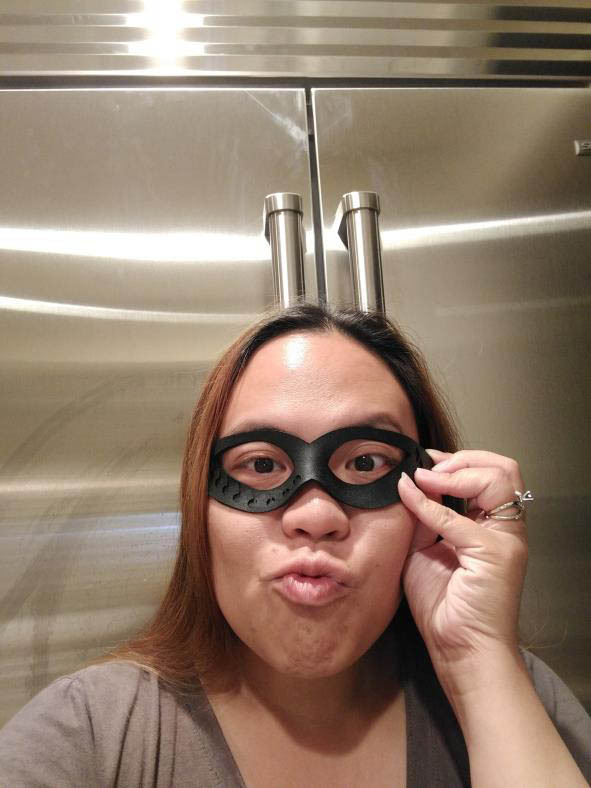 I drafted up designed my HarleyQuinn mask using Microsoft expressions with some added touches. I wanted to incorporated her collar into my mask design. I updated all of my lines to 0.001” weight (to work with the Epliog Helix laser cutter) and exported my file to a PDF. Instead of jumping straight into Worbla it’s good to test out your design in case you realize you want to adjust the look or size. Paper is a cost effective and flexible medium to work with. 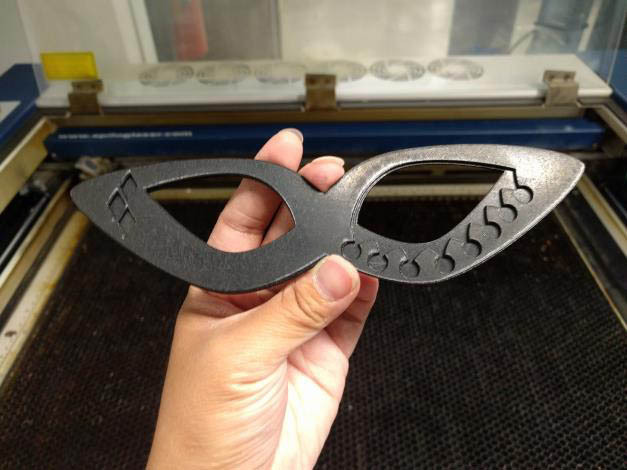 Laser cutters are burning through material so soot often lands on the underside of the object that is being cut. Stacking an extra piece of paper will give you a clean piece to play with. I used a manila folder as the cardstock gives a little extra sturdiness. 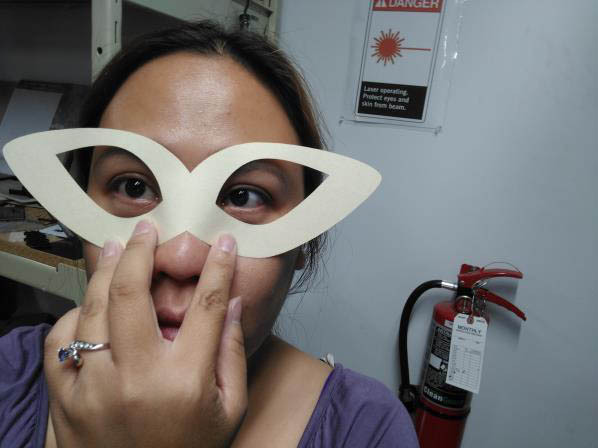 I ended up cutting 5 samples before picking the correct size for my face. You’ll want the Worbla as flat as possible to ensure that the focus of the laser cuts properly. We know that simply unrolling the Worbla straight from the package isn’t going to work out for this, so let’s rely on our trusty irons! 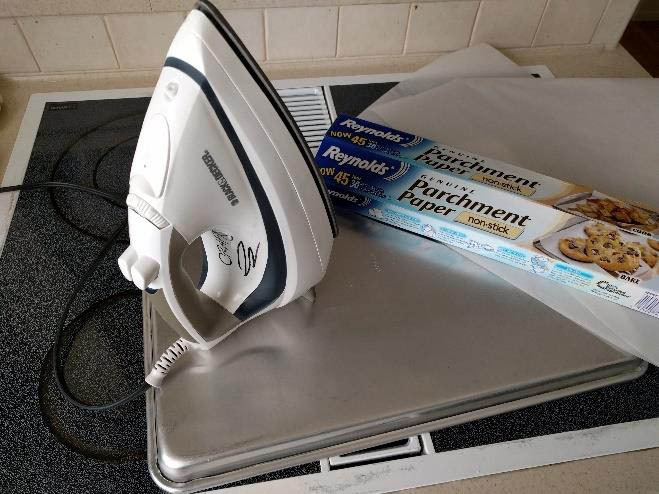 I love using my iron (marked for “crafting” purposes) as the direct contact distributes heat quickly and evenly. i. Place the Worbla under a sheet of Parchment paper on top of a turned over baking sheet. 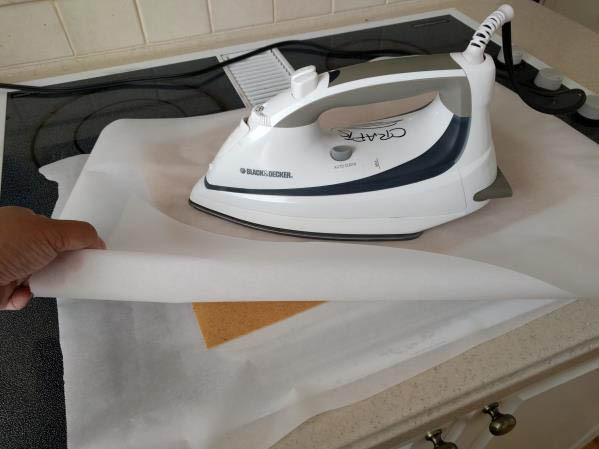 You’ll want to be ironing on a hard surface avoid creating waves, so avoid using any cushioned ironing boards. iii. Gentle strokes in in a single direction. Do not leave the iron to sit or it will create an impression. 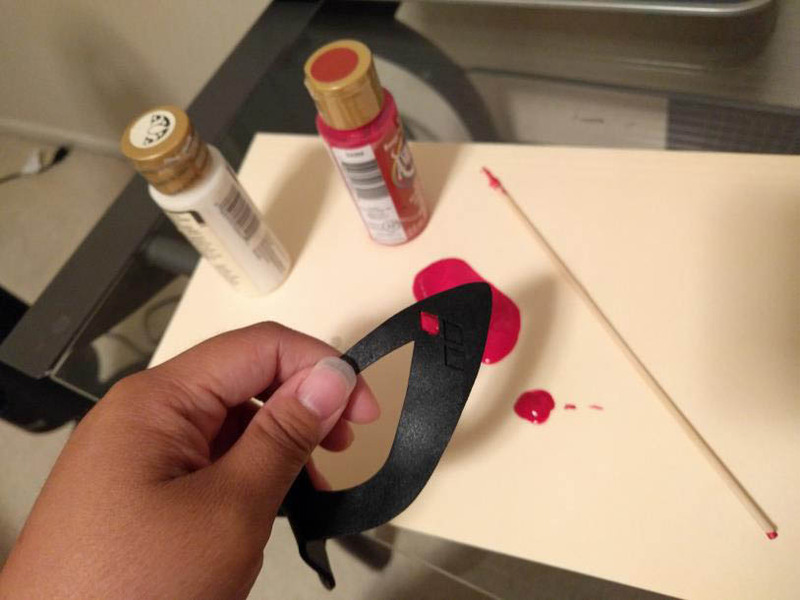 Don’t apply additional pressure, the activated Worbla may spread and thin out if pressure is applied. Best analogy is to think of this as like rolling out pizza dough, don’t do it as the inconsistent thickness may create inconsistent cutting results in the laser cutter. iv. Allow the Worbla to cool on the baking sheet. Adding a second baking sheet on top with some weights can produce even better results. I used an Epilog Helix laser cutter paired with a Bofa fume extractor to cut my material. I opened PDF file in Adobe Reader and opened my Printer Properties on the Epilog Helix printer. I’ve noticed that while cutting the Worbla the surrounding plastic can still warp due to the heat of the laser. To limit the height of the Worbla from shifting try to weigh down the Worbla with some tape or shoving under any rulers if your machine allows. It’s so magical to watch the laser go ~zoom zoom zoom~. Little sparkes and fire are no big deal, though turning down the power will reduce the amount of ash you may need to wash up afterwards. 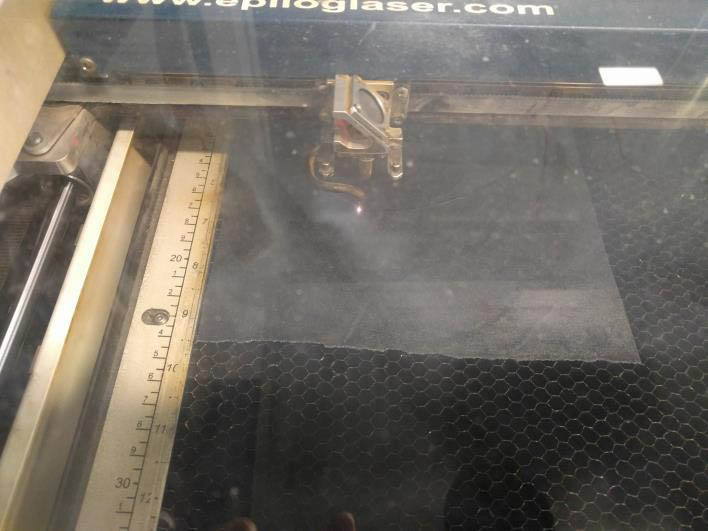 Laser cutting will product fumes and soot. Before opening the cover after cutting give it a few seconds for the air to be vacumned out. Here is my final cuts. Two matching pieces that will be layered together. 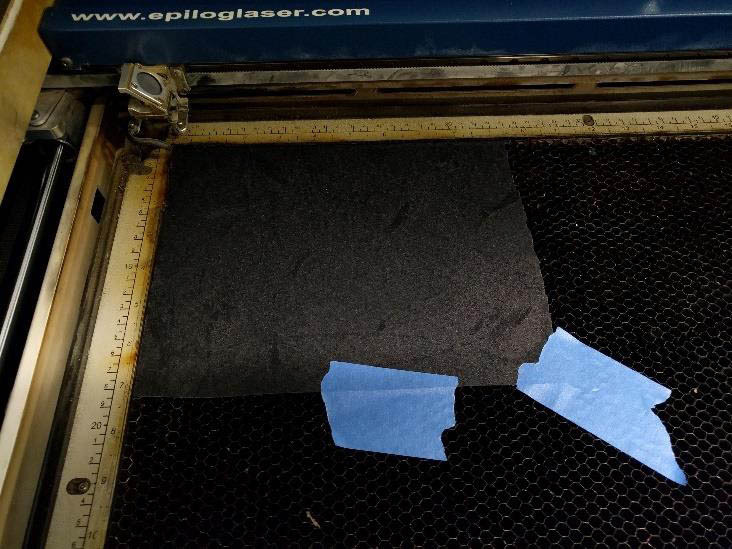 If you want to do the sandwich method for more thickness and structure you can also cut craft foam using the same laser cutter, but you’ll need to two separate files. The craft foam shape should be the original size while the Worbla should have all edges thickened adding at least the half thickness of the EVA foam. For example if you are working with 4mm EVA you will want to move your lines 2mm outwards to account for the folded Worbla. Forming the Worbla will result in cleaner lines if you attach the two pieces while they are still flat, once they are curved you will notice the outer piece may need to be stretched or the inside will be pinched. Back to the iron, heat the two pieces and quickly lay them on top of each other. Once the Worbla is no longer a single layer or flat you will want to be using a head gun instead. While the Worbla is still soft lay it on a foam head to mold the shape especially around the eyes and nose. The final thing to do is to paint my piece. I wanted to fill in my diamonds with Red to match the HarleyQuinn’s pants. 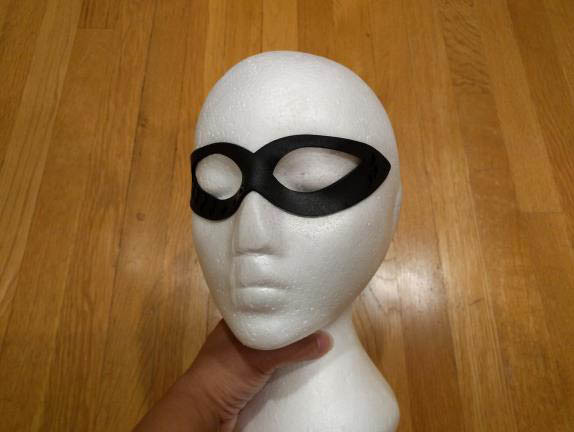 And the White decor around the eyes was to mimic Harley’s collar. My cuts are very small so instead of using a paintbrush I used a bbq skewer dipped in paint. 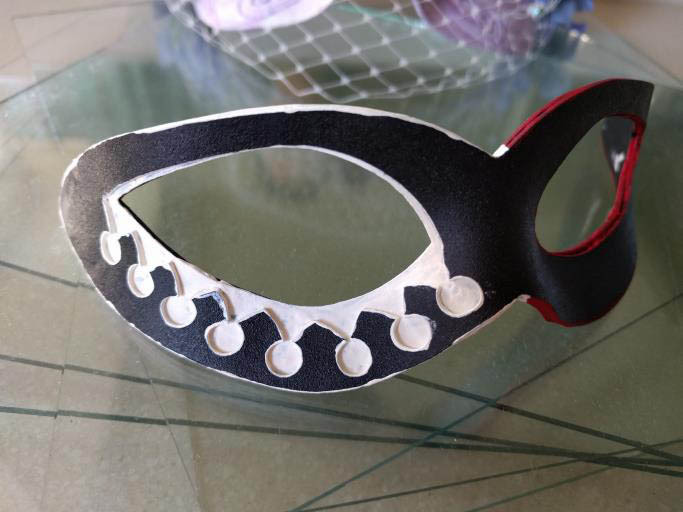 I’m going to wear this with eye lash glue so the mask simply sits on the face, spirit gum is also popular but harder to off any eye brow hairs. Elastic ribbons also do the trick if you prefer. Thanks again to SmallRiniLady for sharing her process with us!